A beautiful white flowering variety, Gardenia ‘True Love’ is has all the fragrance of the best cultivars with large flowers. This is a new release and should make a big impact with gardeners and landscapers alike. The flowers emerge a pure white, large and up to 10 cm across. Flowering commences in early summer and continues for weeks. 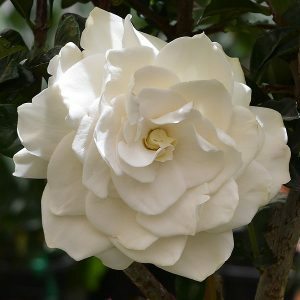 The botanical name is Gardenia augusta ‘True Love’ and it is available as a standard as well as a bush form. The flowers are very fragrant with the the intensity being lifted on a warm summers evening. This variety is said to be be more disease resistant and hardy than some others, it will grow well in the garden or in a container. In containers use a specialist potting mix which will slightly on the acidic side. Mulch around the plant to maintain a cool root run and apply a specialist gardenia fertiliser each spring. Although Gardenias do like warmth, they also like some protection from the heart of the afternoon sun. Pruning is best carried out immediately after flowering in summer. Like all Gardenias, choose a frost free position and a well drained humus rich soil. Gardenia ‘True Love’ ® is available for sale from the following nurseries.